MARCH 2016 – Sound Post provided ADR (Dialogue replacement) with actor and friend Ralph Lister for the Warner Brothers / Marvel Comic movie Batman v. Superman. 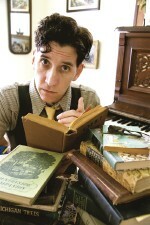 Ralph plays the part of Dr. Emmet Vale. 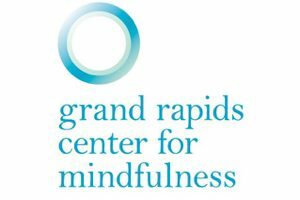 FEBRUARY 2016 – Sound Post partners with the Grand Rapids Center for Mindfulness and their mission to offer research-based mindfulness programs to manage stress and enjoy increased health and wellbeing. FEBRUARY 2016 – At Sound Post we completed the recording and production of TWO audiobooks by New York Times Bestselling Author Dr. Emerson Eggerichs – for HarperCollins Publishers. LOVE & RESPECT, THE LOVE SHE MOST DESIRES AND THE RESPECT HE DESPERATELY NEEDS. Sound Post hosted Dr. Eggerichs for several days of recording the updated audiobook version of this New York Times bestseller. 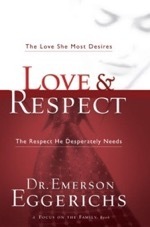 Touted by leaders as a “classic” among marriage books, Love & Respecthas sold over 1.6 million copies! Love & Respect reveals why spouses react negatively to each other, and how they can deal with such conflict quickly, easily and biblically. MOTHER & SON: THE RESPECT EFFECT. 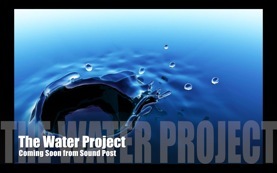 Sound Post hosted Dr. Eggerichs for several days of recording of this soon-to-be released book. 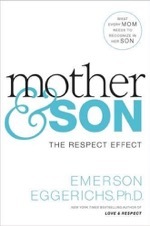 Just as the New York Times bestseller Love & Respect message transferred family relationships with a biblical understanding of love and respect, Dr. Eggerichs now turns these principles to one of the most important and misunderstood relationships of all, the mother and son relationship. The definitive guide for a mom that wants to better understand her son and connect in a whole new way. 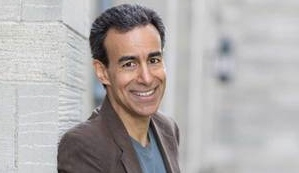 JANUARY 2016 – Sound Post continues to record actor Kevin Yon’s pre-game voiceover for CBS Thursday Night Football. You’ll hear Kevin (recorded in Sound Post’s Studio B) during the pregame tease. They are real artifacts. But of what ? A lost people? Or of the largest archeological fraud in North America? 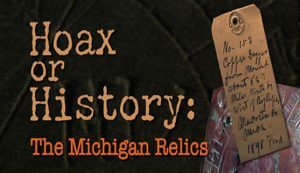 Watch and learn about the Michigan history you never knew. At Sound Post we worked with Thom Bell to provide audio post production and mixing for this amazing documentary. Thom will be at tonight’s screening to answer questions. 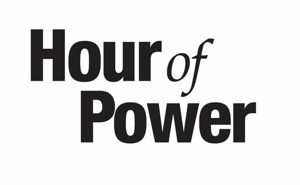 NOVEMBER 2014 – January 2015 ~ Millions of viewers heard music mixed at Sound Post for “The Hour of Power.” Led by pastor Bobby Schuller, the service from Shepherd’s Grove Church in Garden Grove, California, is seen around the world and online. 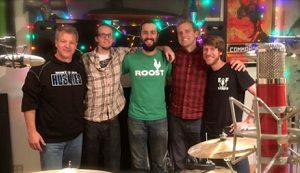 NOVEMBER 2015 – The Five Amigos – Sound Post’s Stuart Poltrock with musicians Max Lockwood, Dan Rickabus, Steve Leaf, and engineer Larry McKay at the wrap of a music recording session for The Amway Corporation. Starting with a basic idea and emotion this talented crew recored the basis for three original scores that will be heard worldwide. 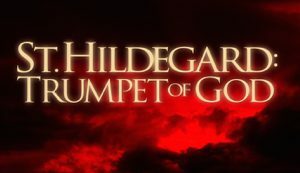 NOVEMBER 2015 – Sound Post provided the audio post production, sound design, and mixing for “St Hildegard: Trumpet of God.” The creation of writer, artist, and performer Linn Maxwell and produced by Rasikas Films, St. Hildegard: Trumpet of Godspotlights the amazing prophecies about the antichrist and the end times that Hildegard preached in public during her later years. St. Hildegard, never one to mince words, speaks out once again with an urgent message for today’s believers and the clergy who shepherd them. Describing herself as a “strong female warrior” and a “trumpet – obedient to God,” she publicly rebuked the clergy of her day for being weak and sexually immoral. FALL 2015 – Coming to a Sunday school near you in 2016! 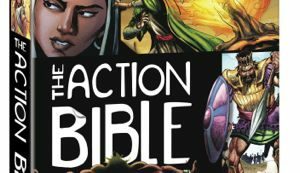 David C. Cook Publishing’s The Action Bible in video form with music, voices, and sound design produced by Sound Post’s Stuart Poltrock. With a Five Star Amazon rating, “The Action Bible is a wonderful book and I highly recommend it! It is faithful and lively. People of all ages will read this and develop a hunger to now turn to the Bible and find therein a deeper appreciation for our God and His work for us in Christ.” ~ review from My Digital Seminary. 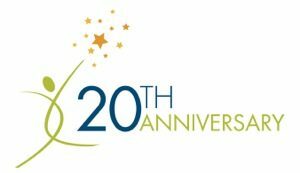 SEPTEMBER 2015 – It’s been an amazing 20 years this first week of September. AUGUST 2015 – Season 2 of School Zone Publishing’s ‘Charlie & Company’ is currently in production at Sound Post. The stars of the show are a golden retriever named Charlie and his teacher Miss Ellie, who is played by the award-winning actress Danielle Augustine. 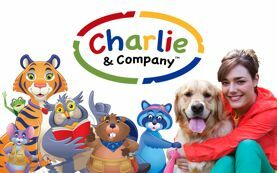 In each episode, Charlie and Miss Ellie take a “learning adventure,” an exciting trip to a surprise location full of entertainment and teachable moments. Charlie and Miss Ellie learn important educational skills and valuable lessons about friendship from the people they encounter at each destination. 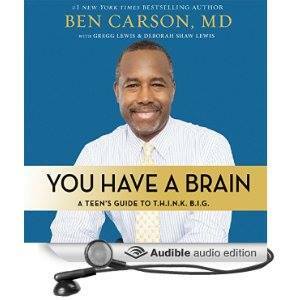 FEBRUARY 2015 – At Sound Post we recorded presidential candidate Dr. Ben Carson’s audiobook ‘You Have A Brain – A Teen’s Guide To T.H.I.N.K. B.I.G.” for Zondervan Publishing. 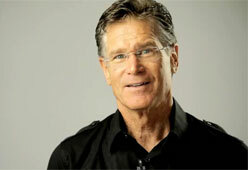 The book is spoken by voice actor Dan John Miller. Do you want Dan John Miller to read for your project? Give us a call. OCTOBER 2014 – Thriller! Chiller! names Stuart Poltrock of Sound Post Recording Studios as recipient of the 2014 Storey Award. The recipient is awarded based upon their body of work, their selfless contribution and its impact on building community relationships which promote and connect Michigan’s artists to a larger audience around the world. 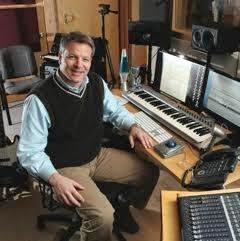 “With nearly two decades of professional recording and sound design service to the West Michigan Film and Video community and abroad, Stuart Poltrock’s contributions to numerous productions are as admirable as they are outstanding,” said festival director Anthony Griffin. 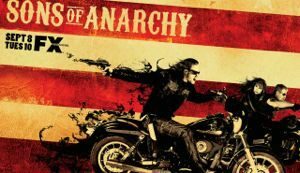 OCTOBER 2014 – Sound Post hosted actor Jeffrey Ross Newman and recorded ADR for ‘Sons of Anarchy.’ Jeff, in addition to being a fine actor, is a visual artist and was in Grand Rapids to participate in Art Prize. AUGUST 2014 – Sound Post now goes to eleven. Version eleven is the new standard for audio production. The most powerful digital audio workstation just got more powerful. 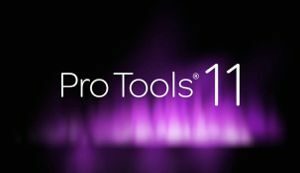 Pro Tools redefines professional music and audio production for today’s workflows. From all-new audio and video engines and turbocharged “64-bit” performance, to expanded metering and new HD video workflows, Pro Tools enables you to take on the most demanding sessions and maximize your creativity—without holding anything back. 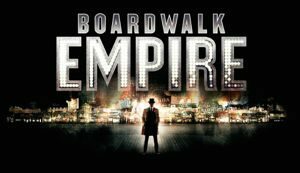 JULY 2014 – At Sound Post we completed ADR for scenes from ‘Boardwalk Empire’ with the delightful actress Erin Dilly. ADR (dialogue replacement, sometimes called ‘dubbing’) is a necessary step in the audio post production of a feature film and is used when the sound recorded on the set is noisy, the dialogue unclear, or when the director wants to replace an actor’s line. MAY 2014 – Sound Post hosted ‘A Perfect Armenian’ author Keri Topouzian and producer Elisabeth Veltman for the audiobook’s open, close, and Q&A recording and editing. 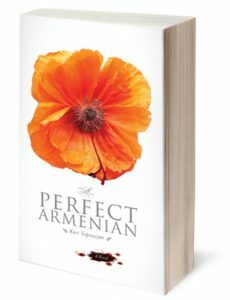 A wonderful first novel based upon historic events, A Perfect Armenian leads us into the intimate world of cultural conflict. From Constantinople to Cyprus, the novel takes the twists and turns so deeply rooted in the duality of human nature. Purchase your copy here. MAY 2014 – The narration for the opening teaser of the 2014 Indianapolis 500 was recorded in Sound Post’s Studio B. 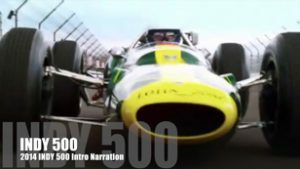 Combining a montage of select historical race footage, the music of The Rolling Stone’s ‘Gimme Shelter,’ and a superb narration by actor Kevin Yon (recorded at Sound Post for ESPN using our ISDN connection), this race tribute was seen by millions. 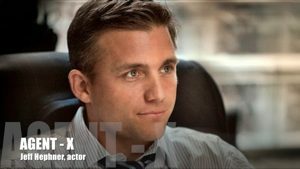 APRIL 2014 – Sound Post provided ADR (dialogue replacement) with actor Jeff Hephnerfor TNT’s pilot series ‘Agent X.’ The pilot stars Academy Award winning actress Sharon Stone, James Earl Jones, Olga Fonda, and Gerald McRaney. 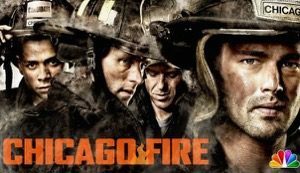 Michigan native actor Jeff Hephner plays the title role of John case, aka ‘Agent X.’ Sound Post hosted Jeff along with close family members for an ADR session. 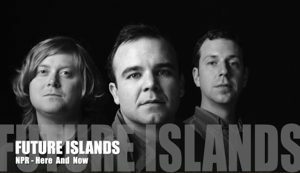 MARCH 2014 – Sound Post hosted the band Future Islands for their ‘Here And Now’ interview on NPR. Days after their appearance on The Late Show with David Letterman, NPR host Jeremy Hobson interviewed the band using Sound Post’s ISDN connection. 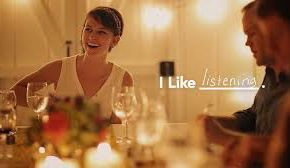 October 2013 – Sound Post collaborates with Baas Creative to complete the final sound for ‘I Like Listening’ – new in the ongoing ‘iLikeGiving‘ film series to encourge generous living. “This is a campaign for a generous world because we believe a generous world is a better world for all of us. But we don’t want your money, we want your action. Live generously” – try it. OCTOBER 2013 – Sound Post will have a presence at the 135th meeting of the Audio Engineering Society in New York City. We’ll be meeting with industry manufacturers and software reps to determine the next upgrade to Studio A – and maybe catch a Broadway show.